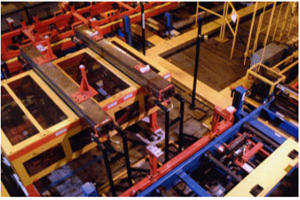 High Lift and Low Lift Fork Transfers - Automatic Systems, Inc.
High Lift Fork Transfers are used to remove product from one conveyor carrier or skid and transfer it to another conveyor carrier or skid. ASI has built High Lift Transfers with vertical travels up to 70 feet. Horizontal travel is usually in the range of 8-9 feet. High Lift Transfers can be used for “C” vertical path or “Z” vertical path transfer. Custom designed parts contact pickup details, ensuring clean transfer and accurate positioning when handling parts. 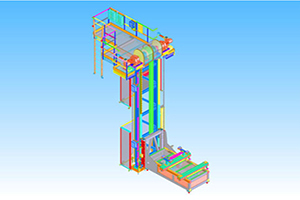 ASI’s compact cantilever carriage and tower design conserves space and provides ease of maintenance access. Service platforms can be provided for the drive. Main and standby drives can be provided for both the fork transfer and lift drives. Transfers can also be made side to side using a Low Lift Fork Transfer. 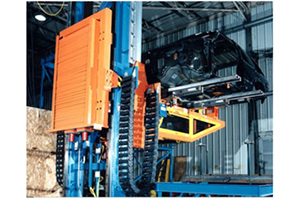 Low Lift Transfers are limited to a vertical travel of about 30″. Horizontal travel is the same as with the High Lift Transfers. Custom Extension length is available.